Following the suspension in early May of two clinical trials of arbaclofen, a candidate drug for treating autism and fragile X syndrome, parents are appealing to the U.S. government and several pharmaceutical companies to continue testing the drug. Parents are collecting signatures in two different petitions to continue the trials, conducted by Massachusetts-based company Seaside Therapeutics. One petition, on the government website We the People, has so far amassed 600 signatures of the 100,000 required for the government to respond. The other, at change.org, an online platform for raising awareness of various causes, has been somewhat more successful, with 4,000 signatures to date. Seaside canceled the two long-term trials for autism and fragile X after the results from one of their clinical trials turned out to be disappointing. In May, Seaside announced that its largest arbaclofen trial in people with autism had shown that the drug did not, as had been hoped, reduce social withdrawal more than placebo did. The results led Switzerland-based Roche, Seaside’s collaborator and funder, to pull funding for the remaining clinical trials. Meanwhile, Roche plans to continue research into RG7314 and RG7090, two compounds that its researchers are testing for autism and fragile X treatment, respectively. Seaside has worked on arbaclofen for several years. The drug is designed to stimulate the receptors of GABA-B, a neurotransmitter that inhibits nerve cells. Studies suggest that people with autism have an excitatory and inhibitory imbalance. A 2012 trial conducted by Seaside showed that arbaclofen reduces social impairment in people with fragile X. But the trial did not meet its goal of reducing irritability, which Roche says was also a factor in the decision to pull funding. Interestingly, some participants with autism showed significant improvements on tests of daily functioning and communication. Parents petitioning for the drug also report these improvements in their children. “That is what we have found very promising,” says Wang. But, because the trial didn’t set out to test these measures, he says, the company needs to redo the study — provided they find the money. how has arbaclofen compared to the already approved drug baclofen? i would think that parents who are not able to get arbaclofen anymore would want to ask their physicians whether their child has coexisting medical conditions like spastic muscles or reflux that would suggest that baclofen might be an appropriate medication. When a drug company says that a drug was ineffective in a trial, they usually mean that its effects did not surpass the response in the placebo arm. It would be interesting to know how high the placebo response was. I’m one of the parents of a child with fragile X who was participating in the extension trial for STX209. An interesting note about this medication is that many kids improved in measurable ways that were unrelated to the primary endpoint but were used as secondary endpoints. Of course the FDA doesn’t give any weight to the secondary endpoints for approval. The trial results should be readily available, Seaside generally publishes quickly but I have not looked for them. 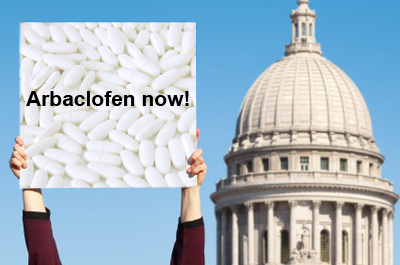 There is some disagreement among clinicians regarding baclofen. Arbaclofen is the right side of the drug. I’ve been told that the ratio is 10:1 (L:R) and that in order to use baclofen to get a therapeutic dose of the right side you would have an unacceptable risk of injury/overdose. That said, some clinicians are prescribing it to help with the titration period. We’ll see how long people use it beyond that point.